There are many factors involved in creating an amazing cup of coffee. The journey begins with buying high quality arabica beans that were grown on a reputable farm. Next is to ensure that the beans are roasted by a roast master who has a thorough understanding of the many physical and chemical transformations that take place throughout the roast process. If the roast master does not have expert knowledge in thermodynamics, heat transfer, and chemistry as it pertains to the bean, one can only hope for average coffee from that roaster. Another very important factor is the quality of the water being used for brewing. We only use filtered water at all of our community cafes. Additionally, grind size is important, as the flavor extracted from the ground beans will vary along the spectrum of fine to course. Choosing to follow the above suggestions will reward you with a delicious cup of coffee every time you brew, right? No! Even if these factors are attained, chances are a great cup of coffee will not be created. Why? Because one factor is almost always overlooked. Freshness! Coffee should be brewed within two weeks of being roasted. After two weeks, the coffee begins to go stale and lose flavor. What is so special about two weeks? 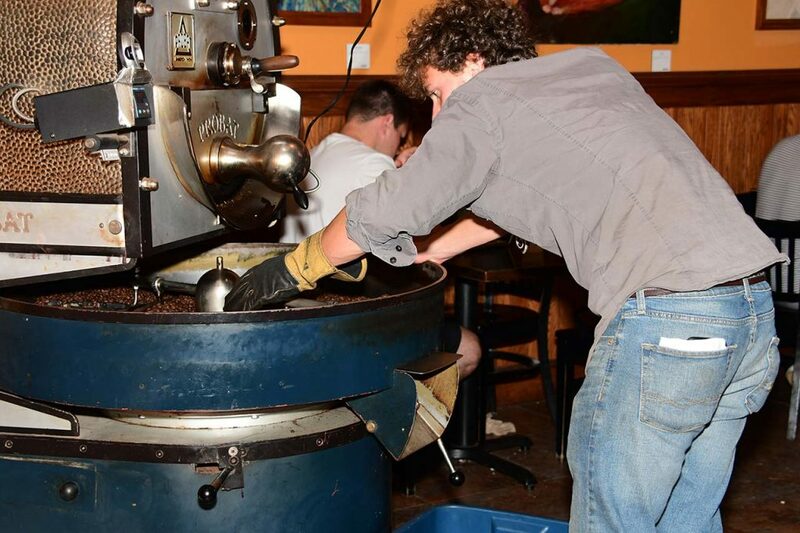 Coffee degasses after it is roasted. It basically exhales CO2 for roughly two weeks. Because each roasted bean is in the process of exhaling, it cannot absorb oxygen which causes coffee to go stale. The older the coffee, the more readily it absorbs oxygen and staling accelerates. With this said, coffee that is three weeks old will still taste good, just not as outstanding as coffee that is one-week old. However, coffee that is older than a month is noticeably bland. If one goes to the grocery store or specialty food market, bulk coffee from some of the world’s most reputable coffee companies are sold. One will see names such as Starbucks, Peets, Stumptown, Gimme, Blue Bottle, Intelligentsia, etc. Most of these coffees will have a posted shelf life of 6 months to a year. These companies all claim that their coffee remains just as fresh after 6 months as when it was first roasted. The claim is made because most coffee companies package their coffee in bags that contain a one-way valve. This one-way valve allows the CO2 gas to escape the bag, but does not allow air or oxygen to enter the bag and make the coffee go stale. Does it work? Yes and no. As long as the package is not opened, the coffee will still have that great taste. However, once the package is opened, oxygen is quickly absorbed into the beans causing a rapid loss of flavor. The only way to prevent this is to brew and drink the entire bag of coffee upon opening. That is obviously not practical or healthy. If selling coffee older than three weeks lessens the integrity of the product, why do most companies do it? The simple answer is money. There is a lot of money to be made in wholesaling coffee and almost every roaster wholesales. However, it is logistically impractical to only keep coffee on the shelves for a couple of weeks. The waste of product and man-power would be immense in order to rotate coffee that frequently. The one-way valve packaging helped alleviate this logistical nightmare, however, it is very incomplete. The solution is to buy coffee direct from a roaster that simply will not sell coffee to the consumer that is older than 10 days. Uncommon Grounds does not wholesale because we do not want the integrity of our coffee compromised. We only sell through our three cafes or our website store to ensure that our coffee will always taste great for our customers.